Frederick Francis became a statistic at the age of 36. His was one of 1,032 lives taken by Britain’s railways in 1879. Back then, where trains went, death too often attended. Struck at just 10mph, Francis lost a boot, found later by the engine driver with his foot still in it. His left leg was crushed; six ribs had been broken and his scalp bore a large gash. But this wasn’t suicide or the aftermath of trespass. The deceased was “a railway servant” and had been hand-picked for the duties that killed him, such was his diligence…and misfortune. 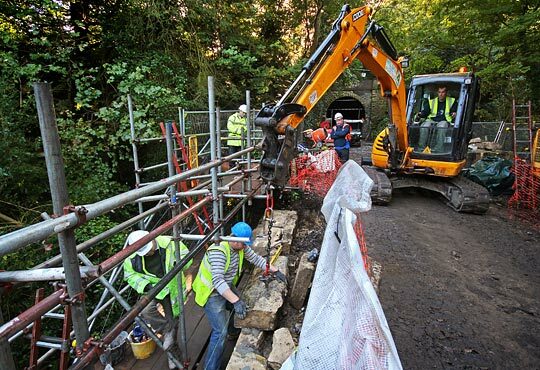 Combe Down Tunnel receives attention to one of its refuges. Recruited by the Somerset & Dorset Railway in 1877, Francis joined a permanent way gang under foreman platelayer Henry Ingle. Their patch encompassed the line’s centrepiece - the 1,829-yard Combe Down Tunnel which had opened three years earlier after 15 months in the making. A cabin was built into its east sidewall to accommodate them. Francis’ attachment to the gang proved eventful but brief. On Friday 13th December 1878, shortly after the 7:20am goods had passed through, a substantial collapse blocked the tunnel close to the northern entrance. This spoiled the weekend for upwards of 70 labourers who spent it clearing away the debris. Four weeks later, a second fall dislodged timbers supporting the roof, again disrupting services. By spring 1879, the tunnel was alive with industry as a works party extended the lining - which had originally encased just the extremities - and rebuilt sections of existing brickwork. On 21st March, sidewalls were being taken down 300 yards from the north end. Francis found himself alone, much further into the tunnel, replacing a broken fishplate bolt. 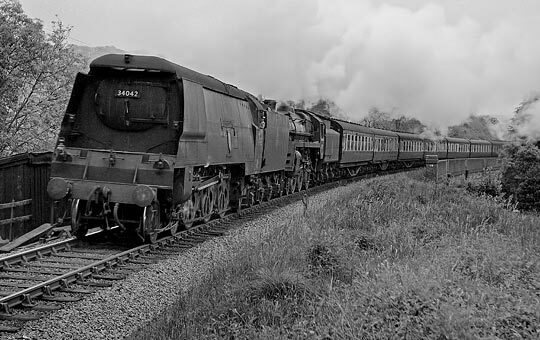 At around 2:40pm, a Wimborne to Bath train entered via the south portal. The change in air pressure would have tweaked his eardrums and caused the flame of his hand lamp to flicker, but neither prompted Francis to stand clear - an error of judgement he paid for. He lay next to the track, still conscious, until the locomotive foreman arrived from Bath where his boot had been discovered. He was soon claimed by his injuries. At the inquest, Ingle “could not account for the accident” as there was “plenty of standing room”, by which he meant 2 feet 9 inches between wall and train. 34042 climbs over Tucking Mill Viaduct, bound for the Come Down's south portal. This preamble serves to illustrate that tunnels are more than just grotty holes through hills. Each conceals a unique history, adding another dimension to its three physical ones. 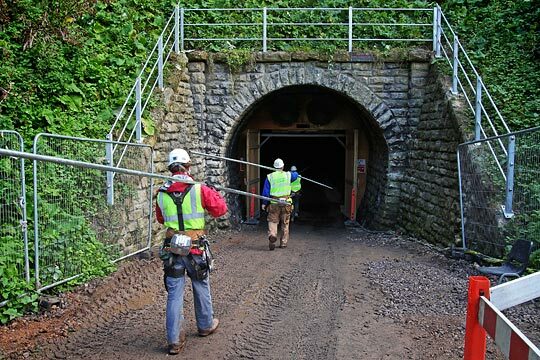 While Combe Down’s last operational chapter was written in 1966, a sequel is in development as the tunnel prepares to become a conduit for people once again. Harnessing the S&D’s former trackbed - including Combe Down and Devonshire tunnels - as a congestion-busting artery into the heart of Bath had been floated before. But wishful thinking gave way to campaigning muscle throughout 2005 when a group of like-minded cyclists formed the Two Tunnels Group to give the idea a firmer push. Traction was gained when Sustrans, the charity behind our ever-expanding National Cycle Network, included it in a successful bid for £50 million of lottery funding. Collectively known as Connect2, the aim was to improve journeys across 79 communities by establishing links between existing paths. That was five years ago. 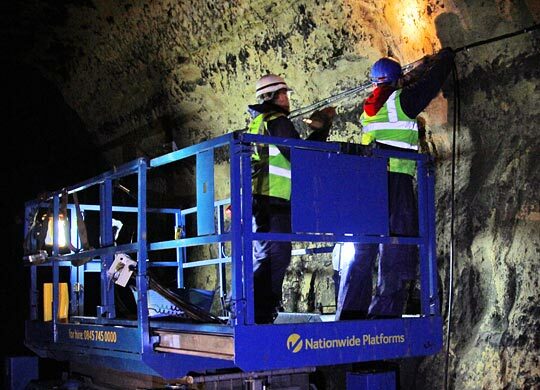 Procedural challenges subsequently hampered progress on Two Tunnels, but issues surrounding the route’s structures were resolved and appropriate surveys undertaken. The first earth moved in 2010 when excavators unplugged the buried northern portal of Devonshire Tunnel. Earlier this year, a 30m footbridge was hoisted into place over Monksdale Road, spanning a gap previously occupied by a railway structure. And the S&D’s bridge across the Great Western Main Line - threatened with demolition by impending electrification - has been reprieved to host the new path, albeit delayed while investigations and repairs take place. One of the abutments for the Millmead Road footbridge is inspected. What’s left is a demanding works package that involves joining together the tunnels, an eight-arch viaduct, two three-span bridges, cuttings and embankments with 2¼ miles of tarmac. Another footbridge - comprising a 40m Warren truss - has also to be installed following diversion of a gas main that ran too close to the desired alignment. In an age of austerity and financial scrutiny, the value-for-money on offer here is outstanding, even before the local economy accrues its benefits. The total bill will be just £2.5 million - perhaps enough to buy a step-free footbridge over a railway. Pragmatism is key: what needs to be done gets done, but nothing is gold-plated. And the venture has not been overburdened by gooey layers of management. 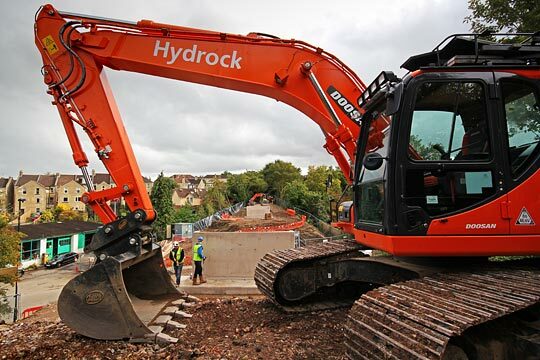 Patrick Tully, Senior Engineer at Sustrans, is overseeing the project - one of the most ambitious the charity has undertaken; contracted to deliver it is Hydrock, with Senior Site Manager Julian Geer leading the team. Mobilisation got underway in late June with the establishment of two compounds - one at the north end of Devonshire Tunnel, reached via a haul road around Bloomfield Park, and the other two miles to the south-east beneath Tucking Mill Viaduct. An encapsulated scaffold was wrapped around this structure. Devonshire Tunnel's north portal was buried beneath landfill until excavators unplugged it in 2010. 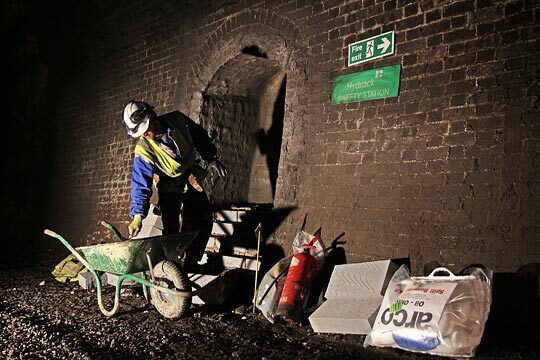 Physical works on the tunnels began on 23rd July with the removal of gates, a blockwall and years of accumulated detritus, thereafter allowing the installation of temporary lighting. 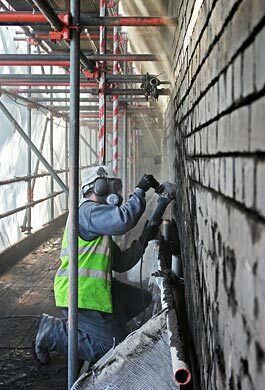 To rid them of their soot, gritblasting has taken place to a height of 2.4m. Complicating the logistics between the tunnels is tranquil Lyncombe Vale and its three underbridges, one of which required a new deck before access over it could be gained. Throughout the site, structural repairs have been carried out by subcontractor Falcon. Heading southwards, Devonshire Tunnel (SAD/10) is first to be met, 447 yards in length and lined throughout in masonry. Prior to Sustrans securing a 40-year lease, this had benefited from the inspection regime of British Railways Board (Residuary). Few remedial works were needed, with minor repointing at the crown, some crack stitching around the portals and brickwork repairs to the wing walls. Aluminium piping has been fitted into existing weep holes to ensure they don’t get blocked. Routes have then been established to allow water to reach the tunnel’s p-way drainage, around 200m of which has been renewed. A drainage pipe is attached to the sidewall of Devonshire Tunnel. Beyond the southern approach cutting is SAD/11, a 2.2m underbridge with its new 250mm concrete deck, a product of HDG Construction. The original span had been removed following closure. Its abutments’ upper brickwork was loose, missing or spalled - this has been reconstructed in Staffordshire blue brick; so too has some of the masonry. Low parapet walls with galvanised steel handrails were added above the slab. While the work was straightforward, the bridge would restrict access through the site until the concrete had cured sufficiently to carry construction traffic. September’s inclement weather worked in the team’s favour, ensuring full strength was exceeded in just 14 days. The line was carried on embankment as far as SAD/12, a three-arch underbridge. Little attention was demanded here except stitching to vertical cracks in the piers, brickwork repairs at the parapet ends and some spot repointing. Due to erosion beyond one end of the bridge, stub trench sheet walls have been built as retainers at both sides of the path, tied together beneath it to provide mutual support. A simple, neat solution. Works to this and SAD/13, a single-arch bridge across a cutting, were carried out from MEWPs; elsewhere, platforms were erected by S N Scaffolds. The overbridge required little more than its vegetation being cut away. The string course of SAD/14 is rebedded ahead of the parapet being rebuilt. SAD by name and nature was bridge 14, another three-span structure close to Combe Down Tunnel. This had kept the line’s engineers busy, with both the piers and arch barrels refaced in blue brick, as well as numerous patch repairs to the spandrels. But only when its ivy growth had been stripped was it apparent that the parapets were bowed to below the string course. As an addition to the planned works, these have been taken down, rebuilt and secured to a concrete reinforcement strip inserted behind them. Until its recent transfer to Sustrans, ownership of Combe Down Tunnel (SAD/15) had been vested in Wessex Water, for reasons even it didn’t fully understand. Despite its size, rehabilitating the structure has not proved onerous: descaling spalled brickwork to alleviate any risk, a fair quantity of repointing, and drainage reconstruction particularly at the south end. Although its lining was extended following the 1878 collapse - which is marked by a significant change in section - much of the tunnel’s central portion features only occasional collars of brickwork, exposing the honey-coloured Bath stone which characterises the local architecture. Some of this was extracted from mines above the tunnel. Refurbishments to Tucking Mill Viaduct (SAD/16) necessitated a full scaffold. Originally built for a single track, a second structure was erected on its west side in 1903 as part of a scheme - ultimately abandoned on cost grounds - to increase capacity into Bath. The pair was skinned in engineering brick to seamlessly tie them together, although movement has since resulted in some arch barrel cracks. These have been stitched and the skin extensively repointed. Tie bars have been introduced where bowing was identified in the spandrels. A new waterproofing membrane, hoppers and pipework will improve the drainage situation. The scaffold allows one of the workers to grind out a perished mortar joint. Extensive repointing has been carried out across the viaduct. Prior to the works, blockwalls at either end prevented access onto the viaduct; these proved so impregnable that 83 reptiles had colonised the deck. A licenced ecologist relocated them. 52 feet above ground level, the parapets had partly succumbed to vandalism so they were lowered slightly and tidied up. 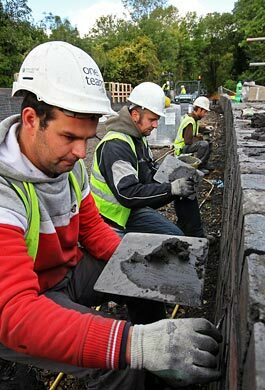 Blue brick has been used to infill the open refuges and replace aesthetically displeasing breezeblock repairs. A concrete coping has also been poured. Yet to be installed is the tunnel lighting, although its cabling is already in place. Externally, this runs in a duct buried through the site, together with fibre optics for CCTV coverage - a security stipulation. To deter lurkers from standing in them, the bases of all the refuges have had a steep concrete slope inserted. Self-evidently, lighting plays a major role and brings conflict with it. Current Standards remain silent on tunnels used for foot and cycle paths, but it’s clear that humans favour bright while bats welcome gloom. The compromise will see directional LEDs set at a height of 2.7m, creating a dark space at the crown. Lighting Services Group is geared up to install them. On top of this, United Visual Artists will brighten many of Combe Down’s refuges with feature lighting and a soundscape of musical voices. 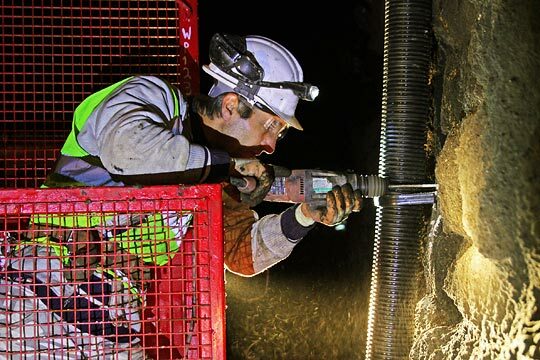 Electricians attached the lighting cables in Combe Down Tunnel. But ethereal matters take a back seat as the project’s most challenging element looms: tarmacking in confined spaces, hitting upwards of 200m daily to stay within programme. There is little room for manoeuvre - a 2.5m surface must be laid through 3.2m tunnels so once the paver is in situ, the vehicles feeding it must travel back and forth over the same route. “Sorted”, asserts Julian before outlining his plan: six track dumpers with a pivoting seat and dual controls will obviate any need for reversing. They will meet at designated passing places, each carrying 3 tonnes of material per trip. To deal with the fumes, fans installed at the tunnel entrances will push fresh air through at 2m/s, clearing Combe Down in 14 minutes. Eight years after a local, Mark Annand, resolved to change the map of Bath, the improbable Two Tunnels Greenway is approaching fruition. It benefited from a slice of “right place, right time”, but couldn’t have happened without the campaign group’s drive, the ambition and tenacity of Sustrans, and, in Hydrock, a contractor with proven delivery skills. Cartographers will be on standby in January. Many twists and turns have been woven into the story of Combe Down Tunnel since Frederick Francis played his bit part. What an anti-climax it would have been if the last page had brought decay and abandonment. Saved from that fate, the plot is about to thicken.